Dr Barton at the AHA Seminar Series in the Roderick Bowen Library and Archives Reading Room. 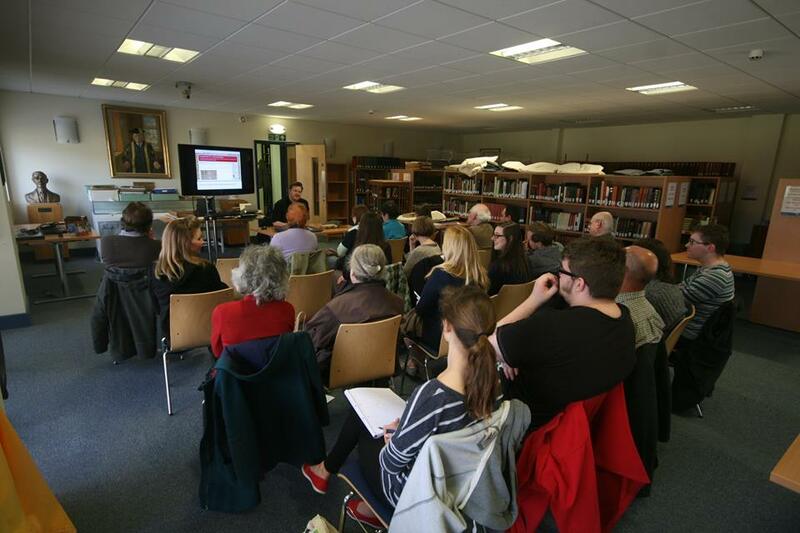 Are you interested in the rare books and manuscripts held in the Lampeter campus archive? Art Historian Dr Allan Barton is currently researching the Roderic Bowen Archive in Lampeter and sharing his findings online. From Oxford Binding, marbled “pastedowns” to original “endbands” the art of book-binding is explored in the researchers blog which includes notes, photographs and details about the making-processes behind these magnificent medieval books. The blog explores the aesthetic and material value of books in the archive and contains numerous unique photographs that detail information that can be retrieved from these artefacts. The researcher also draws attention to notes found inside the book on the tops of pages scrawled in ink. Some of these marks, notes, and quips date to the year 1600 and earlier! Dr Barton writes that one book has the: “inscription on the title page: ‘Johannes Jenour me possidet’ ‘John Jenour, owns me’ in an early sixteenth century hand – and what appears to be the cost of the set of books ‘iii.li xiii.s …’ (£3 & 13 shillings), a significant sum”. Bishop Thomas Burgess of St David’s, the founder of St. David’s College (a “constituent” part of UWTSD), wanted the college to have “an important library and he started collecting books from his friends and supporters well before the college opened and and these formed the nucleus of the library”. The Bowdler family and Surgeon Thomas Phillips (East India Company) contributed their personal collections to the college, these, in addition to Bishop Burgess’ contribution, form the “bulk” of the collection that has been added to over the years. 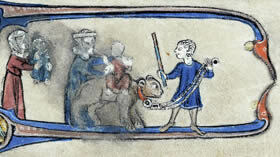 Two women holding out babies for rides on the back of a bear, from the right border of a page of the Lampeter Bible (1279), one of the manuscripts in the RBLA. Dr Barton notes “The blog entries are very much a work in progress, they are a way of ordering my […] thoughts and highlighting the importance of this little known but valuable collection. If you read the blog thinking that this is ‘process’ rather than ‘product’ you won’t be disappointed.” By sharing his original research online the researcher is providing open-access to the development of his analysis whilst simultaneously showcasing unique examples from the brilliant resource housed in the Roderic Bowen archive on the Lampeter campus. his research of the collection to the AHA seminar series. Dr Barton is based on the Lampeter Campus, where he is the Chaplain. Find out more about the Roderic Bowen Library and Archives here.